A very fine quality Cushion Cut Ruby Blue sapphire with brilliance and colour is the astrological Life stone for the signs with Lagna Capricorn & Aquarius for enhancing health, stability, defence from any crisis, vision, imagination, peace of mind, flow of income, wealth, assets, savings, power in speech, presentation and confidence. It is also an absolute must for rising sign Lagna Taurus & Libras regarding rise in luck, rising, spirituality, status, prestige, career, profession, establishment, power, authority, peace of mind, happiness, family comforts, properties, assets, creativity, activity, vision, imagination, decisions and choices making strategy, education and birth of a child. 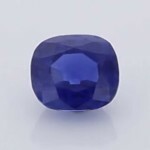 A Blue Sapphire is must for all the Business or professional people whose profession is based on property, building, building material, steel merchant, coal merchant, miner construction, land, property developer, petrol, liquor & Alcohol .